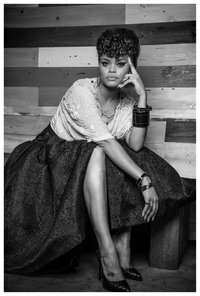 Cassandra Monique "Andra" Batie known professionally as Andra Day, is an American singer and songwriter from San Diego, California. Her debut album, Cheers to the Fall, was released in 2015 and peaked at number 48 on the US Billboard 200 chart. The album was nominated for Best R&B Album and the album's main single, "Rise Up", was nominated for Best R&B Performance at the 2016 Grammy Awards. Day also notably appeared alongside Stevie Wonder, who is partially credited for her discovery, in an ad for Apple TV in late 2015. Her Cheers to the Fall Tour began in November 2016. This webpage uses material from the Wikipedia article "Andra_Day" and is licensed under the GNU Free Documentation License. Reality TV World is not responsible for any errors or omissions the Wikipedia article may contain.